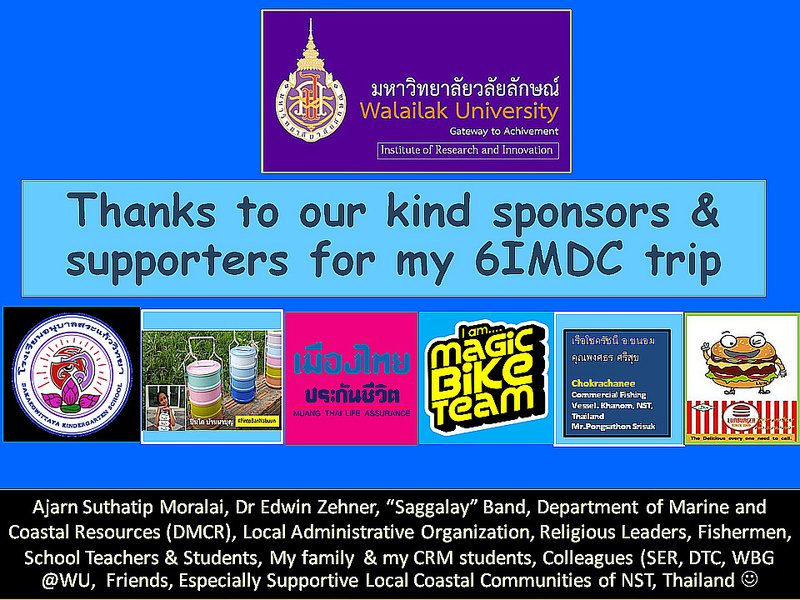 WU’s lecturer gave a talk on the Sixth International Marine Debris Conference (6IMDC) in USA. 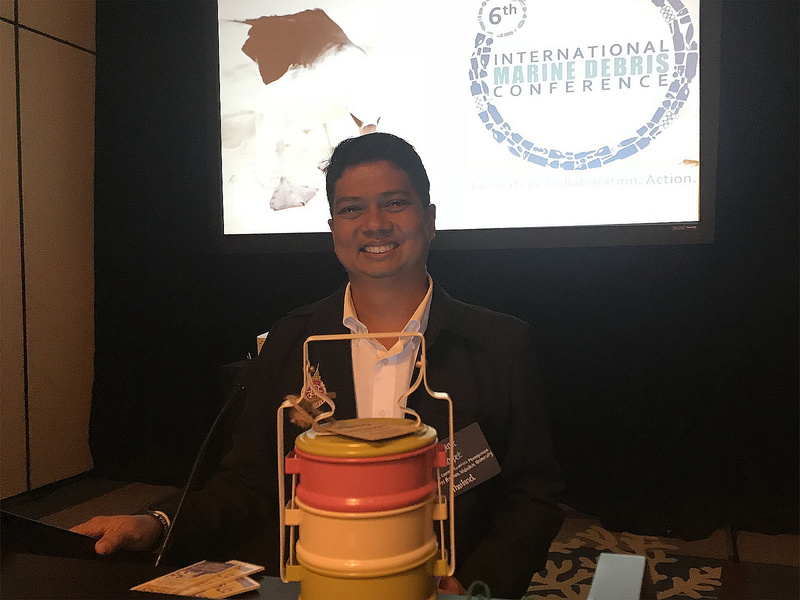 Mr. Phusit Horpet, a lecturer from a Marine and Coastal Resources Management Technology (CRM) program, School of Engineering and Resources (SER), Walailak University (WU) joined the Sixth International Marine Debris Conference, 6IMDC at the Hilton Mission Bay Hotel, San Diego, California, USA during 12 – 16 March, 2018. The 6IMDC aims to continue supporting global innovation, collaboration, and action in preventing and managing marine debris issue. This conference also promotes the reduction of waste materials from their origins such as “zero-waste initiative” and “single-use plastic reduction” campaigns. The 6IMDC brought together more than 700 participants from 54 countries around the world, with 2 representatives from Thailand. Stakeholders included academics, scientists, policy and decision makers, multinational agencies, coastal and ocean resource managers, waste management representatives, public sectors, private industry, NGOs, youths and artists. Many countries in our region gave their high priority to the issue and are actively trying to promote the issue internationally. Discussion areas were on research, microplastics, outreach, reduction, partnerships, and policy related to the marine debris challenges. The conference presented various ways to address the complexity of marine debris problem, ranging from basic and more advanced removal techniques to youth engagement and marine debris arts, for example. Mr. Phusit gave his talk on the title “A Long-Term Study and Series of Awareness Raising Activities for Marine Debris Reduction: Case Study of Participatory Multi-Sector Approach from Southern Thailand”. This education program helped to raise community awareness on the marine debris issues, some of which have included learning activities with undergraduate student CRM project since 2007. Activities were conducted throughout the year with 3 main activities being held on important days for local marine conservation, beach and mangrove cleanup including i) Local World Dolphin Day (14 April); ii) Local World Oceans Day (8 June); and iii) Ko Kra Archipelago Day (Local Ramsar Site) (12 August). Various kinds of creative activities and marine debris arts include, for example, 1) Beautiful Beachcomber, 2) 3R_OK, 3) The Sea Fence and 4) 365-day saving challenges from recycling plastic bottles. The work demonstrates a continuation of coastal cleanup campaigns with many groups of stakeholders, in particular local children and school students. This helps to raise both local and general public’s awareness of marine debris issues and conservation of natural resources within Nakhon Si Thammarat’s coastal communities. This is, therefore, a great opportunity to share knowledge, experience and strengthen regional and international cooperation in order to combat with marine debris issues more effectively. We will continue our activities, “Think Globally & Act Locally”, especially with young and enthusiastic students on “the zero-waste commitment” and “the reduction of single-use plastic materials” campaigns. Ultimately, we aim to collaborate and sustain these activities with our partners at regional and international levels.